Bungee Jumping – You won’t forget this incredible 7-story drop. 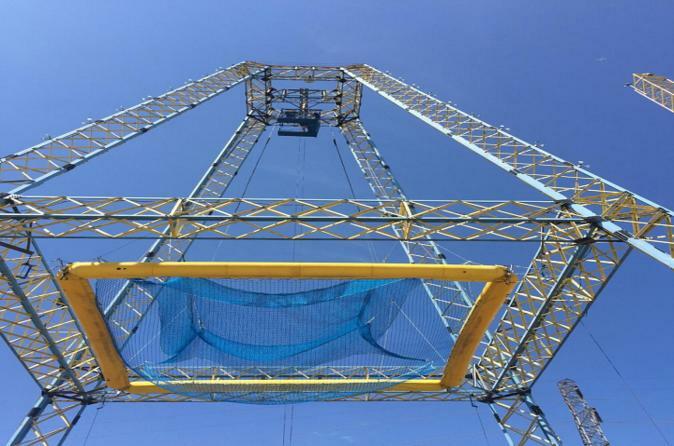 Bungee jumping in the heart of the Metroplex? It’s just one of the surprising Dallas things to do you’ll only find at this Thrill Park. Some classic thrills never go out of style, but that doesn’t mean you can’t find ways to do it better. This jump is done from a seven-story permanent Air Boingo tower, a platform designed specifically for bungee. Skycoaster – This exhilarating ride for up to 3 guests sends you soaring through the air at 60mph. Feel the anticipation build as you are lifted 110 feet into the air. On this ride, you pull your own ripcord, so the thrills don’t start until you’re absolutely ready for it. Texas Blastoff – You’ve seen rides that shoot you into the sky before but you’ve never seen anything like the Texas Blastoff. Think of it like a giant slingshot. The Texas Blastoff rockets you and a friend straight up 150 feet into the air with the speed of a Top Fuel dragster – zero to 70 in 1.2 seconds! But rather than fly straight back down, the four-bungee apparatus takes you on a topsy-turvy free fall. Be prepared for twists, turns and flips. Nothin’ but Net – This is a 16-story free fall. Of all the things to do at Zero Gravity, nothing is more unbelievable than this. You are lifted to just below the top of the 16-story tower and then simply let go! No bungee, no parachute, no straps. Just you, a 130-foot drop, and the safety net below. Skyscraper – The newest sensation. Noted one of the top things to do in Dallas. To start, you and a friend are strapped into one end of a towering 165-foot propeller. Before long, the massive windmill picks up serious speed, up to 60mph in just seconds. By the time Skyscraper reaches maximum velocity, you’ll be subjected to an incredible Four G’s of force. That’s more than a space shuttle takeoff.